The 14th Hole requires another tee shot down the left hand side of the fairway as the ditch which you encountered on the 13th continues diagonally across this hole from left to right, there are trees down the right side of the fairway all the way up to the green. The fairway bunker on the left side is a good line. 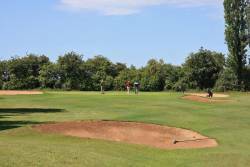 Your second shot is to a wide green which has green side bunkers left and right. Good chance to pick up a shot.